Once a leftover fabric is remanufactured in production, it makes it extra difficult for a brand to prove that it's not "greenwashing". The goal of RR platform is to build the data security and trust that the background story of a leftover material is indeed what it is claimed to be. We follow each garment production order from beginning to end and collect leftover data from aside, double checking the data from different phases of production. Once an order is closed, and leftover registered to be without a use case waiting ahead, we fix the status of the material and help to connect it with next user. Later, when the leftover fabrics gets used in a next order, we provide a certificate for the next purchase order to provide that background story of the material. 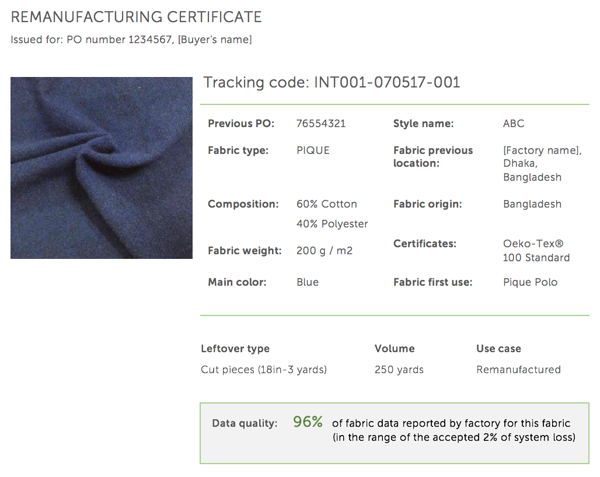 If you received fabrics or scraps with RR tracking code, please make a query on the proof of origin here.